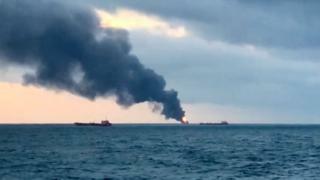 At least ten people were killed in a fire involving two Tanzanian-flagged cargo ships in the Black Sea near Kerch Strait. Russian rescuers try to reach sailors jumping overboard. So far, fourteen people have been saved. A ship is a gas tanker and the fire is said to have followed an explosion that set the other ship on fire. 7 men. Turkey and India and Maestro with 14 sailors. The fire broke out as one ship transferred fuel to another, said spokesman for the Russian maritime agency Alexei Kravchenko, adding that several crew members were then forced to jump overboard. The agency said earlier that "no signal from one of the two captains" had been received. The crew members sailed in "neutral waters" in the Black Sea when the incident occurred, the authorities said. The Kerch Strait is a field of tension between Russia and Ukraine. In November, Russian border guards occupied three Ukrainian naval vessels near the narrow channel connecting the Black Sea with the Sea of ​​Azov. A court in Russia has extended the detention of 24 Ukrainian sailors by three months. They are accused of illegally driving in Russian territory. Ukraine condemned the Russian movement and denied that its ships had violated the navigation laws of the region. The strait lies off the Ukrainian peninsula of Crimea, which annexed Russia in 2014.